A Lifetime movie was filmed here in 2003 and is now being shown. The name of the movie is 'No Regrets' so watch your TV listings for show times or order from Netflix. We have also had a recent Vice President and his family spend some of their vacation time here. The home is a two-story, private dwelling with 12-foot high picture windows across the lake side of the house. The great-room has a large living, dining, and kitchen area with 24-foot vaulted ceilings, and a massive fieldstone fireplace. Great room has a new large sofa with built in cell phone chargers for relaxing while you watch 60 inch,smart TV from the sofa. One downstairs Twin bedroom with half bath. Upstairs has two bedrooms and a full bath. One bedroom has a King bed and the other has a Queen bed. Aero Beds are available for two more guests--the kids love them! A large deck with rocking chairs, many marinas nearby for boating, water-skiing, and fishing. Water ski instruction is available at some docks. Pets are NOT allowed; no smoking. No children under 12, and no parties or weddings without owner approval. great way to Christmas shop, beautiful works of art available, or you can enjoy a great fire in the fireplace or both! For country music fans, Nashville is less than an hour's drive. Appalachian Center for Crafts is only three miles. For those who like to antique there are many shops in the area. Cookville is only 20 minutes away and has many large chain stores and restaurants. I have been with VRBO for over 18 years and have one complaint. Also look at all my Reviews and they will tell you how I do business in the correct way. I live in Ponte Vedra Beach, Fl. I am from Tennesee and was raised in Johnson City and Nashville. I have lived in New York, New Jersey, Michigan,and several other south eastern states. I have 3 grown children, 6 grandchildren and 1 great grandson. We all love the lake and the unique log home with the breathtaking view. 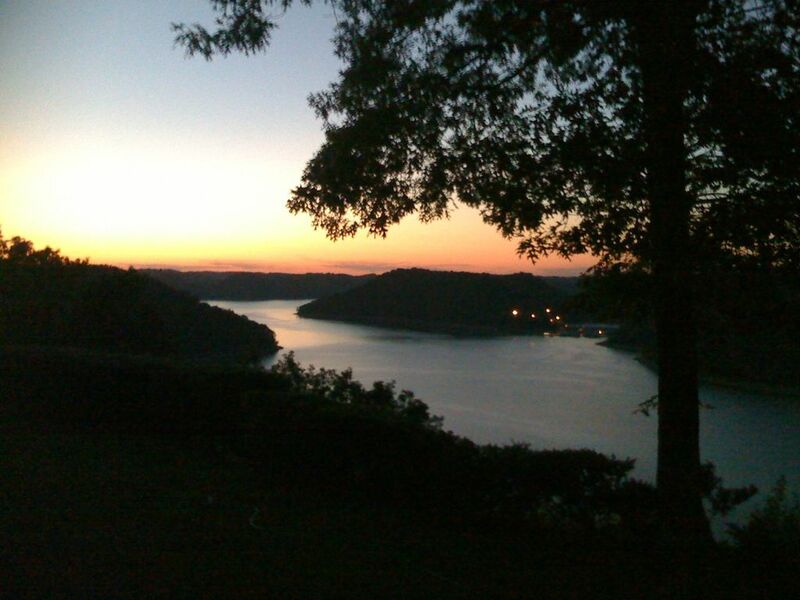 We love Tennesse and Center Hill Lake because of the beauty of the area. It is peaceful but not far from more activity if you would choose to go to Nashville for the day or to Knoxville. We had always wanted a log house and we were so happy when one of our children found the house for us. Once we saw the view and the house we knew it was for us and our family to enjoy when we are not renting for others to enjoy. The beautiful setting that gives us the use of the lake for swimming or a chance to go boating, golfing and hiking on the beautiful Tennessee trails. Just sitting on the deck watching the wildlife and enjoying the view is a treat. Very private gated home with wildlife. The view is one of the very best on the lake. Water is seen from most of the house with Hurricane Bride in site. Large area for cars, boat trailers and more. Plenty of seating with reclining sofa and love seat. The kitchen has a full set of stainless steel pots and pans as well a a Crock Pot, Rice Cooker, Electric Skillet, Blender and Mixer. Massive Fieldstone Fireplace. We have been told many times that we have the best view on the Lake. I got married in the backyard and it was beautiful! Perfect place with a perfect view. We will definitely book this place again! The house was amazing!! The view spectacular!! Susan was so nice to deal with! We will be back!!! Thank you and we are happy you enjoyed the view. Look forward to your future visit! End of the road seclusion, great fire place and back porch. If you are looking for an updated cabin this is not it, kinda rustic and the view just makes it magical. Wonderful host and very responsive. No issues. Thanks for the very kind review. I am glad you enjoyed your stay at our cabin. The fireplace is always a popular attraction in the winter. Summer is popular for those that enjoy the lake and sitting on the front deck and relaxing. We absolutely loved the cabin! We knew there would be a lake view but having never visiting the area had no idea how awesome it would be! The cabin gives you a rustic feel without feeling you are roughing it. Well equipped & furnished. Would recommend everyone to stay here. We had an awesome time. The cabin is beautiful. Thank you for your review. I know I need to have pictures done so people that might be interested in a neat old Log Home might better see how nice it is in a secluded area with a beautiful hard to beat view that is close to Hurricane Marina. I added the 60 inch smart TV in hopes that folks might like sitting before the fireplace to watch ball games in the cold weather. The view is always pretty regardless of the time of year. We loved our stay here! It's a truly unique home with an incredible view of Center Hill Lake. We loved taking walks in the neighborhood, enjoying the rocking chairs and taking in the views of the beautiful lake and all of the boating activity. It's private, peaceful, and exactly what we needed. We didn't leave the house for the first two days of our stay, we were perfectly content where we were. Thank you Susan, for sharing your beautiful home! I hope future renters find the houae as pleasant as you did. We always try to make things go soomthly and appreciate hearing the good and the bad!! We like for our guests to enjoy the unique log home and the fabulous view we are fortunate to have for our guests. Thank you for your very kind and thoughtful review. We hope you will come back again!! All fees and taxes are included. There is a $400 refundable deposit.